This is Jess and Theresa's Honda first Varadero, standing in front of the biggest Norman castle ever built, in Colchester, the oldest recorded town in Britain. This Vara was purchased from Red Line Honda in Colchester in 1999. She gave us a lot of fun and took us to VIM2, 3, 5, 6, 7 and 9. 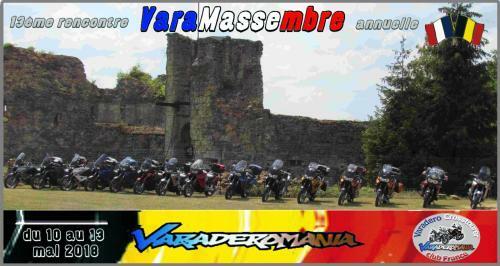 We bought a second Varadero in 2008 and she took us to VIM 10 in Hungary, VIM 12 in Austria and VIM14 in Catalonia. We were also delighted to be welcomed by our French brothers and sisters at their 2009 meeting and subsequent meetings. We bought our third and last Varadero in 2012, the last of the breed, before the model faded away into distant memory and the Crosstourer took over, soon followed by the new generation Africa Twin. We first made contact with the Big Man, Bernard Stikfort of the Netherlands, whose website contained much information for Varaderoists and, all important, Richard's message board. All that is now history, as our means of communictions have changed through websites and Facebook pages. VIM13 in Slovenia and VIM16 in Norway were not possible for us due to the June date. We moved permanently to live in France in 2017. We thought that we would give a British view of Varadero riding with this web page, especially as our European friends have done so much for the cause already. Above and below, you will find links to other Varadero sites. The following links are our personal diaries of the various VIMs (later renamed VCIMs, international) and VUKs (UK) and Varaderomanias (France) that we have attended. Whilst we would be pleased to receive your comments on any issue, please share any views that you may have with the rest of the community on the various forums of the links above. Only the International and the UK sites have English language forums. ...and here are a few VIM logos. The 2007 XL1000V Varadero comes loaded with a host of new features that enhance its styling, convenience and long-term riding comfort for longer years of crosstown or cross-continent riding enjoyment. The Varadero's newly designed instrument panel features new dial designs for a more attractive look and easier recognition, and a new fuel mileage gauge that calculates remaining driving distance based on fuel volume and current fuel consumption. For added riding convenience, the Varadero's cockpit now features convenient new carrying compartments built into the sides of the cockpit area, which help keep needed smaller riding essentials within easy reach. As these pockets also feature locking lids, the security of these essentials when parked is also assured. The Varadero's seat contours have also been carefully redesigned for greatly enhanced riding comfort for both rider and passenger over longer touring distances. The Varadero's sidecover panels have been newly redesigned for more compact and stylish shapes that also lend easier access to hard-to-reach service points and other functional parts. The new 2007 Varadero also features a new, more sleekly designed tail cowl, which tapers with smoothly rounded rear contours into a large, fully integrated combination tail/stop light and clear-lens indicators for a more modern look and enhanced visibility from the rear. 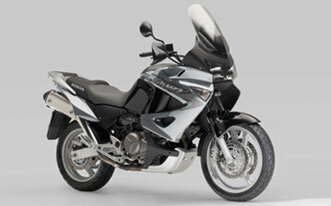 The Varadero's prominent twin high-mount exhausts play a distinctive role in its impressive Adventure Touring design. Now these large stainless steel canisters receive a more cosmopolitan look with new decorative form-fitted end caps, which provide a stylish accent on the Varadero's intrepid go-anywhere design. The Varadero's large resin undercowl has been replaced with a more sturdy new aluminium lower cowl that enhances protection of lower engine components while providing a more rugged look as well. In keeping with the latest in environmental protection laws and Honda's ongoing efforts to protect the air we breath, the 2007 Varadero features a new HECS3 oxygensensing catalytic exhaust gas converter system. This system effectively controls engine operation to minimise the emissions of harmful gasses and ensure full compliance with Europe's strict EURO-3 emissions regulations, all while maintaining the top performance and swift acceleration for which the Varadero has won renown. The Varadero's new colour variations feature two-tone graphics that exude a lighter, more luxurious image whether at stop or on the move.